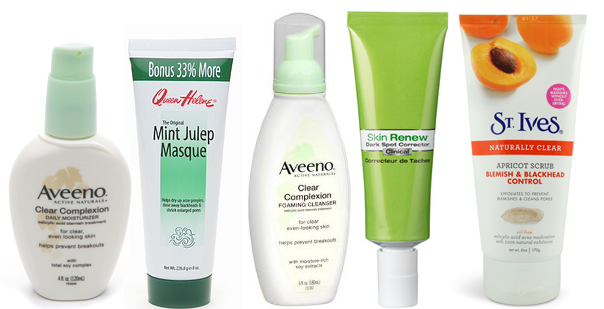 lovelifeoutloud: Best Acne Fighting Products! Acne was not my friend all through high school and into my college years. I tried a bunch of different products before I found my holy mix of goodies and today I would like to share what worked out really well for me. This is by no means a wake up with perfect skin the next day tutorial, everyone's skin and body chemistry is different so it's a matter of trying a bunch of things until you find what works for you. This is just an idea of some of my favorite products, the majority of which you can find at your local drugstore! First of all this power duo of Aveeno Clear Complexion Moisturizer and Aveeno Clear Complexion Foaming Cleanser were a must have during my horrendous acne years. Acne fighting cleansers and products are extremely drying because the aim to zap out all that excess acne causing oil pooling up in your pores. Most people don't realize the importance of following up with a good moisturizer because if you dry your skin too much it can actually become irritated and result in more zits. Both of these contain salicylic acid which is the ingredient you want to look for to clear up acne or any kind of clogged pores! This foaming cleanser is gentle enough to use daily to effectively clear up your skin without over drying it. On days where you want a little extra fight in your face washing game, the St. Ives Apricot Scrub is your guy to call on. Nothing else felt like it stripped my face clean (in a good way) and really sloughed away all those dead skin cells like this stuff did. They've dramatically extended their product lines now and there's a whole bunch of different scrubs that I've all heard rave reviews about, but I will always stay loyal to the original apricot because it really saved my face a few times. For a spot treatment my pick has to be the DDF Acne Spot Treatment. The only drawback is that they don't sell this separately, it's only part of a set but fingers crossed that one day they will! This is my overnight miracle and I use it very sparingly. A small dab onto any pimple and in the morning it has shrunk at least half the size and the redness is gone. I'll admit this one is a new find but I'm so obsessed with the results I'm kicking myself for not discovering this earlier! The Queen Helene Mint Julep Masque is just perfection. It dries up acne in just one use and it feels very cooling and nice on the skin so it reduces redness dramatically. I'll use this about once a week if any acne sprouts up, or even as an overnight spot treatment if I don't want to slather it all over my face. Be warned that this does leave your face feeling quite dry so definitely follow up with a good moisturizer! These last two are sort of bonus items. They aren't acne fighting per-say but post-acne treatments. No matter how many times my mother reprimanded me I would still pick at my pimples (don't do it!) and consequently I ended up with a lot of scars and discolorations. Even though it's expensive the Garnier Dark Spot Corrector has been a miracle at evening out my skin tone. I went through an entire tube (4-5 months) before I even noticed a difference but it was definitely worth it in the end. A more concentrated spot treatment is the Derma E Scar Gel. For those scars that are borderline pits in your face, pick up one of these jars, it's made a world of difference in diminishing the difference in tones. What are some of your favorite acne fighting products?